Welcome to Inspiration Tuesday at STAMPlorations! This week we're highlighting Deepti's line of stamps, Dee's Artsy Impressions. I've used Little Love Birthday Wishes, perfect for the little men in your life. 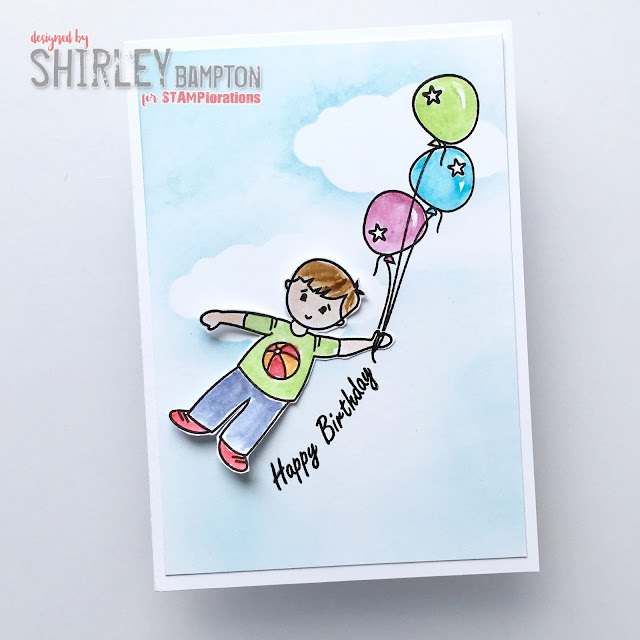 I stamped the balloons and coloured them, then masked them while I sponged the background (using ARTplorations Clouds stencil). On some spare card I stamped the little guy, coloured him in and fussy cut him. I only attached him by his arm and body, to give the illusion of him floating freely in the air. Pop on over to the STAMPlorations blog for some fabulous inspiration from the rest of the team, and don't forget to leave a comment for your chance to win a gift certificate to the store. Through April all stamps (except retiring sets), stencils and dies are 10% off, no code needed. And while you're shopping, if you use my code STAMPGIRLSHIRLEY you'll get an extra 20% your order. What's not to like? This is adorable--I like your coloring.